The U.S. Department of Agriculture has announced the projects selected to receive the USDA’s annual farm to school grants designed to increase the amount of local foods served in schools. Sixty-five projects were chosen nationwide. According to the 2015 USDA Farm to School Census, schools with strong farm to school programs report higher school meal participation, reduced food waste, and increased willingness of the students to try new foods, such as fruits and vegetables. In addition, in school year 2013-2014 alone, schools purchased more than $789 million in local food from farmers, ranchers, fishermen, and food processors and manufacturers. Nearly half (47 percent) of these districts plan to purchase even more local foods in future school years. Grants range from $14,500 to $100,000, awarding a total of $5 million to schools, state agencies, tribal groups, and nonprofit organizations for farm to school planning, implementation, or training. Projects selected are located in urban, suburban and rural areas in 42 states and Puerto Rico, and they are estimated to serve more than 5,500 schools and 2 million students. This money will support a wide range of activities from training, planning, and developing partnerships to creating new menu items, establishing supply chains for local foods, offering taste tests to children, buying equipment, planting school gardens and organizing field trips to agricultural operations, Long said. State and local agency interest and engagement in community food systems is growing. Having received 44 applications from state or local agencies, 17 state agencies will receive funding. 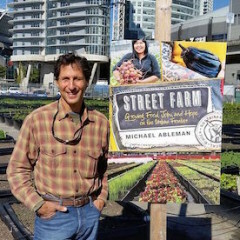 Careful planning, adequate startup capital and experience working on a traditional rural farm are just three of the elements that veteran urban farmer, and co-founder of Vancouver’s Sole Food Street Farms, Michael Ableman feels are necessary to be successful in the new urban agriculture movement. 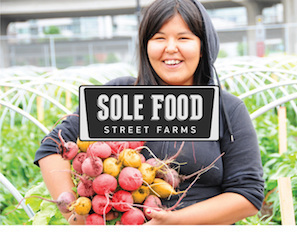 Founded in 2008, Sole Food Street Farms would be considered by many growers as established and successful, but for Ableman there is still much work to be done both at Street Farms and in the development of the city farm movement. Michael Ableman, Co-founder of Sole Food Street Farms, an urban farming social enterprise in Vancouver, Canada. Photo courtesy of Sole Food Street Farms. Employing 20 to 30 well trained local residents (most recovering from addiction or managing mental health issues) and producing 25 tons of food every year for sale though farmers’ markets, a CSA and to approximately 50 of Vancouver’s top restaurants and eateries, Street Farms offers a viable agricultural model for city farming based on scale and sustained success. Street Farms may occupy approximately five acres of space in an urban slum, and it may employ one of North America’s most underserved populations but despite that, Ableman is adamant that his customers should buy his product because of its quality and not its narrative. “We’re not asking people to buy our food out of some sense of charity, or a belief system or our story, which is a good story, but we’re asking them to buy because it is high quality food. We don’t get a pass to be not good farmers,” says Ableman. The farm averages $350,000 in annual income from sales and programming. Focused on preserving traditional Jewish agricultural techniques and furthering the concept of local community, the folks at The Leichtag Foundation incubated Coastal Roots Farm in early January of 2016 after two years of planning and preparation with lots of help from Farmer D, aka Daron Joffe. Located in Encinitas, CA, Coastal Roots is an educational hub offering food, farming and spiritual wisdom for a more sustainable life. The Leichtag Foundation, a Jewish nonprofit philanthropic organization established in the 1990s, bought the 67-acre property that houses Coastal Roots Farm in 2014. Joffe was hired to create the plan and layout of the property. 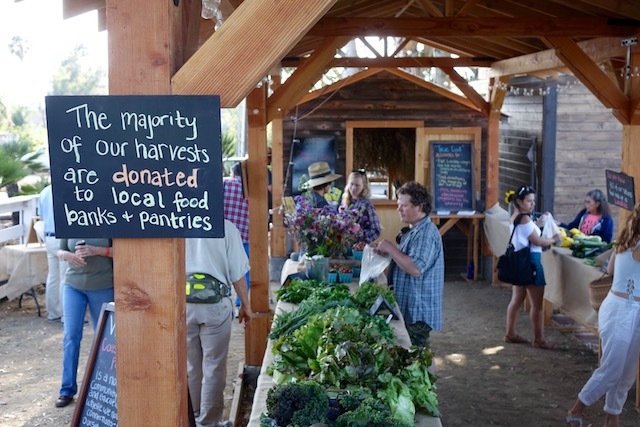 “The idea was for Coastal Roots Farm to be incubated by the Leichtag Foundation but then within five years to be a viable independent community farm that served Encinitas and Glenn County,” says Sona Desai, Associate Director of Coastal Roots. The actual farm is approximately 20 acres in size. In an attempt to model all the different types of agricultural techniques as well as the diversity of urban farming, Coastal Roots has four scales of vegetable gardening areas to illustrate the different scales of urban farming: hand harvest, small electrical tool use, larger tools (i.e. rototiller) and commercial scale tools (i.e. tractors). The different gardening techniques are utilized throughout the farm which is comprised of mixed gardens, a vineyard, a food forest, orchards, animal pasture, a compost area, barns and greenhouses. Around half of the food goes to the farm stand that is operated as a “pay what you can” system increasing availability of local fresh food to underserved communities in the area. Some of the food is sold through pop up markets throughout Encinitas or donated to local hunger relief organizations. Coastal Roots also operates a more traditional CSA program. The farm produced 2,000 pounds last month and approximately 65,000 pounds since its inception. Opening day, April 9, 2016, of Coastal Roots Farm’s ‘pay what you can’ Farm Stand, a new social enterprise that will support the Farm’s mission to ensure that everyone in its community has fair and equal access to local, sustainable food grown using only biodynamic and organic processes. Coastal Roots wants to be more than just another urban farm. Education, on every level, coupled with building a sense of community is integral to the farm’s mission. “We offer hands on learning about farming, gardening, environmental stewardship for people of all ages and backgrounds. We also host gatherings where the community can come together and eat and connect and celebrate together,” says Desai. Being a religiously based organization may seem like a hindrance when it comes to funding a staff of 12 operating on a $1.3 million budget but as Desai explains, it merely allows the farm to consider alternative revenue sources. “It’s an advantage for us in a lot of ways. There are so many projects and activities across the country seeking the same funds that are available for community farms and farm development projects. But we have a niche. Having that niche with Jewish affiliation, we’re able to attract a different set of donors. It really does work as an advantage,” says Desai. Posted at Seedstock.com, April 17, 2017. More at Seedstock.com.